Firstly the Panda Ant is a misnomer, as it is not an ant at all, but a wasp of the family Mutilidae. It is sometimes called the “cow killer” because of the strength of its sting, which, it has been said, can take down an animal the size of a cow. The Panda Ant exhibits sexual dimorphism – the male is a lot bigger than the female and is predominantly nocturnal. The female is more active during the day. It is only the females that are wingless and also only the females that have stingers. 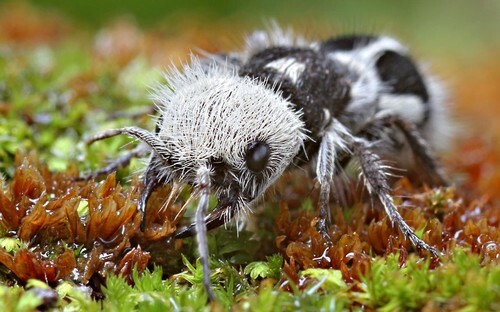 Panda ants feed mainly on nectar. Despite the fact that the female lays about 2000 eggs a year the species is considered endangered. The majority of the young ants are eaten by ant eaters. Those that do survive have a typical life span of 2 years.